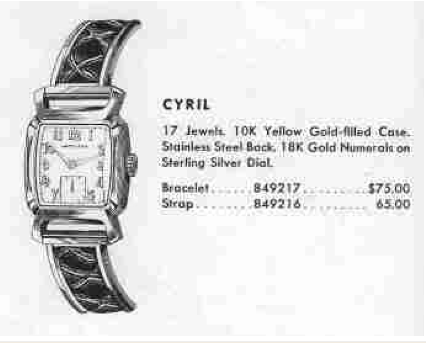 The Cyril was introduced in 1955 and produced for three years. It's unique among Hamiltons in that it came with a leather and metal bracelet. It's pretty rare to see one with it's original bracelet but I just so happened to find one the other day. The Cyril is a relatively small watch. It's only about 25mm wide by 36mm long and it tucks it's 8/0 sized 17 jewel movement compactly into it's case. You'll find either a 747 or a 730 movement inside, as the Cyril was produced when Hamilton upgraded the 747 into the 730. The case is 10K yellow gold filled and it's has a stainless steel back. The dial is sterling silver with 18K applied gold numerals. I think it sometimes looks a little odd with a strap but the bracelet really makes a statement. hello I happen to have a hamilton 747 movement however, it dosent work, i was astonished by your work, my 747 is in prestine condition and there is no evidence of damage or rust, it winds so it means the main spring is good (I hope), there arre no signs of dirt or grime, I have tried to troublshoot but as i am too afraid to take it apart as i am not the best with delicate parts, do you happen to have any suggestions for me to check before I get ripped off at the jewlery store? I would upload pictures if you would like? You need a watchmaker, not a jeweler. 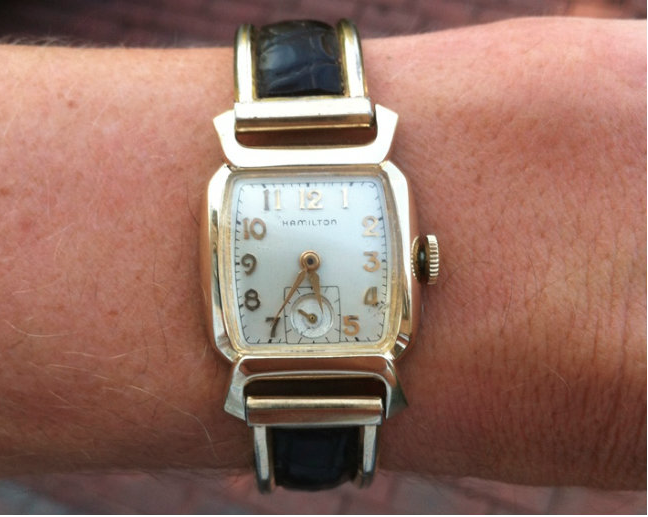 Back in the day, every jewelry store had a watchmaker but that is not the case today. To locate a watchmaker near you, look at the AWCI.com website or do a little googling. If you'd like a recommendation or two... email me using the "Contact Me" link above my photo or through my Etsy shop. ok will do, thank you so much.